You already know what week 14 of the NFL season means — the fantasy football playoffs are finally here! Let’s get serious. You don’t care about your “favorite” team, because your favorite team is a band of 15 guys from different teams coming together to score points for you! 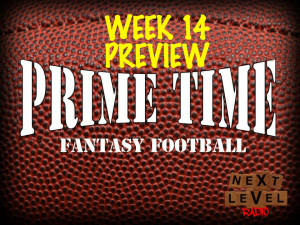 The week 14 preview show of Prime Time Fantasy Football covers everything possible to get you ready for your playoff matchup. That includes what to do with Eddie Lacy, how to handle the Mark Ingram injury, and where your expectations should be with Chris Ivory. Don’t worry, we talk plenty of quarterbacks and wide receivers too. Unfortunately, there’s also a bunch of you who didn’t make the playoffs this year. That’s why we bring you some Show Me The Money and pick games against the spread. The Fantasy Fact of the Week is just to show you how smart we are. Plus, I think we talked about bacon for five minutes. So there’s your reason to listen. Should have led with that.